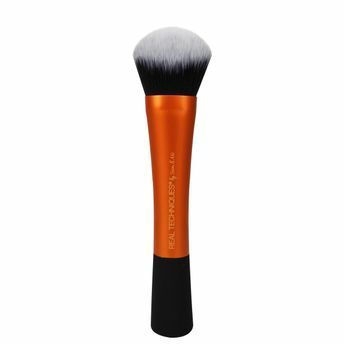 The Real Techniques Instapop face brush is designed for full coverage setting, baking, and powder application. It has an extreme taper for concentrated application. This brush is ideal for the application of loose powders. Synthetic bristles that are custom-cut, easy to clean, and 100% cruelty-free. Extended aluminium ferrules that are lightweight, easy to use, and colour coded. Extreme taper for concentrated application. Ideal for loose powders for concentrated coverage using loose powders. High impact colour without the mess.